At Orthopaedic Sports Specialists Physical Therapy, our team is dedicated and focused on providing our patients the best care possible. In our state of the art facility, we are equipped with all the tools necessary to help get our patients back on their feet in a friendly and encouraging environment. Whether referred from Dr. Joyce’s or referred from an outside provider, we are here to help all our patients recover with a personalized plan designed for their needs. With the addition of the Physical Therapy department to Orthopaedic Sports Specialists, we are able to coordinate with Dr. Joyce and maximize our patient’s care better than ever before. Our highly trained therapists, now operating under the same principals and goals as Dr. Joyce, offer a unique and integrated recovery experience. We want our patients to feel comfortable as they progress through the recovery process. Our post-surgical patients will receive a comprehensive plan with the most current protocols and instructions designed to maximize time with our therapists and help them recover in a manner that is effective for them. Our non-surgical patients will receive the same care and attention with a plan focused on their specific needs. From the initial evaluation to the last, we will personalize our patient’s goals and exercises towards what will be most efficient and produce the most successful results, doing our best to get them back to where they were and reduce the risks of re-injury. 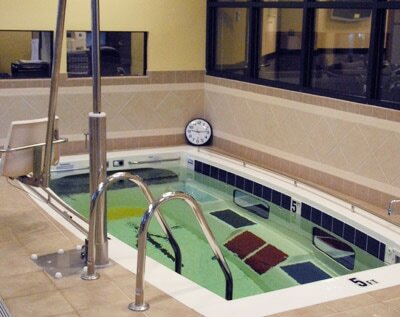 OSS PT sets itself apart with the SwimEx Physical Therapy Pool. Patients of all types find the benefit in using Aquatic Therapy as part of their recovery process. Aquatic Therapy has been proven to improve power, speed, and agility, increase range of motion, improve muscle strength and endurance, as well as balance and coordination, all with the ease of ambulation and reduction of stress on the joints.